Many people have issues digesting grains. One of the main reasons for this is a lack of preparation. There are three ways people have properly prepared grains for centuries to make them more digestible: sprouting, fermenting, and soaking. The latter is the preferred method for oatmeal. Soak 1 cup rolled oats in 1 cup water and 2 tablespoons acid (lemon juice, liquid whey, apple cider vinegar, or yogurt) for about 8 hours. Soaking overnight is very convenient. Consume with liberal amounts of butter and cream. 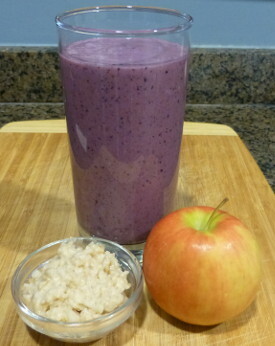 Or toss into your next smoothie and take your oatmeal to a new level of flavor and nutrition. To avoid having to soak oats every night I’ll make 2 or 3 cups at a time and refrigerate for use over the next week or two. An apple and blueberries are what make this smoothie fruity. Feel free to substitute any fruit you have available or if you make this smoothie often mix it up. Enjoy! I’d love to know if you try this fruity oatmeal smoothie and how you liked it. Please leave a comment below. Happy Blending! My husband had his jaw wired closed to correct several issues related to surgery to remove a right Carotid squamous cell cancer mass. He will begin radiation treatments to his jaw and neck. In the meantime, he is on a liquid diet. He is losing weight and can’t start radiation until his weight is stabilized. I have received no help from the nutritionist except a generic handout. I use the protein drinks, whole milk, whey protein powder. He is not hungry and it’s difficult to get him to drink the inbetween snacks. Do you have anything to recommend? There’s got a be a combination of ingredients that he enjoys. Perhaps use more sweetener or sweet fruit than what a recipe calls for to get him interested.